During our visit to Sassier last week, I was apprehended by a roving band of first and second graders who had just finished their school day. Rather than angry, threatening tones, these kidnappers were filled with laughter, giggles and joy. 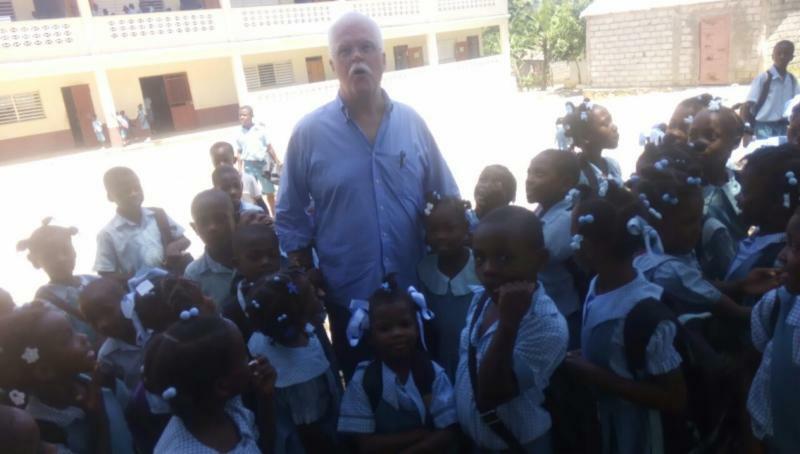 Since Djak Djeri (Deacon Gerry) only visits the school a couple of times a year, I am usually captured by the primary school students at some time during the year. I pretend to be afraid, and they only giggle more and laugh harder. Their intentions? “I am going to take you home,” several of them exclaimed. I suggested to them that their parents would be very surprised and that they would have to feed me. After some intense negotiations, my kidnappers released me, after I promised to come back to play again. It is so wonderful to see joy and hear laughter and giggles from our younger students. Life is challenging in Haiti, even for little ones. Having a safe and nurturing place to go every day brings smiles to their faces. Unfortunately, this is not the case for many children in Haiti, where 25% or more of children in rural areas never go to school. In Sassier, everyone has the chance to go to school, thanks to all of you. Doesn’t hearing their laughter bring joy to your heart? Their laughter is their thanks to you!!! CLICK HERE TO WATCH THE VIDEO OF THE KIDNAPPING!